As if the Table Tonic online store wasn't enough, furnishing our homes with the Moroccan wedding blankets, Ikat cushions and Mexican throws we've been screaming out for all these years, the Table Tonic blog is, quite simply, a gem. A fabulous archive of style news and interiors inspiration all delivered with a fabulous sense of humour. The lovely Louise has inadvertently revolutionised my life by enlightening me on the joys of Shopbop, Dermalogica Skin Smoothing Cream and Japanese hair straightening - not to mention a ridiculous amount of fabulous blogs, style inspiration and, of course, a myriad of home decorating ideas. 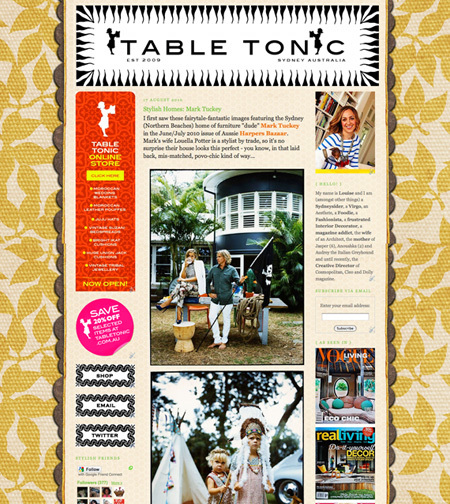 If you haven't visited Table Tonic yet, get your groove on and go say "Hola!". Enlightenment awaits! Table Tonic, I salute you. Jesus! Am I that good? !